Full Batteries! Full batteries, full batteries. The sun is very good to me. My system charges up so fast, now I have power up the *ss. Full batteries. Thanks from Pam and Jim Let me just take a moment to Thank You and Larry so very much. Your hard work was very thoughtful, conscientious and way above and beyond..... I and my husband truly appreciate your very hard work helping us. Thanks from Lance and Kathleen in the Cayman Islands! Good Lord, it's a miracle! The inverter and remote arrived this morning in good condition and Customs Department actually remembered that it's a duty-free item. I am completely amazed to see it here so quickly. Thanks again Chris and gang! Thank you and Larry for all you have done for us. Thank you! You let us know what was happening with our order, even if at times, it was just that things were delayed and so would it take while. Can't thank you enough; you get 5 stars for customer service. ...if at any time you need a great recommendation to a potential customer I would be more than happy to give you one. WOW - what a team! Chris and Larry were incredible to work with. They guided me through the process of choosing the right PV system for my needs, designed it, and gave me instructions on how to install the components correctly. They answered any and every question as well as the "what ifs." Getting the system I wanted with the power production I needed was their main goal. I am completely satisfied. The product I ordered is what I received - not what was left over in inventory - and I received it timely. I've dealt with others in the region and no one can compare to Oasis Montana. If you're looking for the best - call Oasis Montana. We had an amazing day of Thanksgiving with friends from Haiti and the states. We're also very thankful to have our new solar power system up and running. 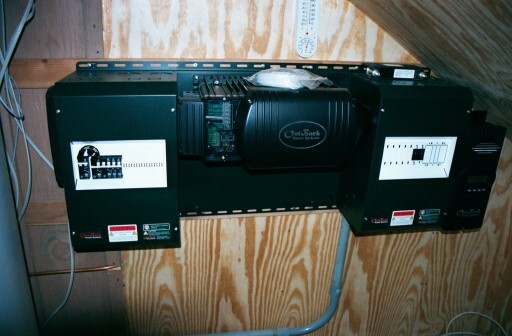 Compared to our old system this new system uses 9 panels instead of 6 and 16 batteries instead of 8. This is a much more powerful system and will help us to conserve fuel by only using the generators before bed for a quick charge to take it through the night. I am extremely happy with the work Mark has done for me and I did recommend him to my neighbors. My new batteries are beautiful and nicely contained in their new box with the new larger cables. Mark was very helpful in making the battery choice and took the time to educate me on the maintenance. Can't thank you enough, Larry, for sending Mark my way. The panels arrived around noon today!!! In perfect shape (as you said they would!!!) I'm still so excited I can't sit still, got to get them mounted tonite!!! Thanks so much for your sales & service & everything. Keep in touch! Just a note to say hello and thank you for your help, customer service, and your follow up to make sure that things, i.e. batteries were performing well. You have excellent customer service and I appreciate your personal touch. In this age of technology, it's refreshing not to be relegated to just another blip on someone's computer screen. Thank you and bless you. Thanks so much for your work on my solar system. I am impressed by your commitment to details and craftsmanship. A truly lovely job. I will recommend your business to everyone! In the future, I will be purchasing my next controller through you and Chris. You have been the Best kind of business people to deal with. I wanted to let you know that I did get my system completed, and it is working awesome. It is so satisfying to know every inch of how it works, and to be using power I've made, without having a generator running. I can only imagine how frustrating it must have been for you to have a guy who knew nothing, asking all the questions and running down different roads with every new answer, but you made this all possible for me to accomplish. You kept your patience and helped me navigate to the end result. The system I now have is exactly what I needed. Magnum products are awesome. The techs at Magnum Energy were very helpful too. I hope you can get a big satisfaction out of knowing how much you helped. You were my source of direction toward Magnum products and I believe there could not be a better company to supply products and service tech support. They have to be the best. I'm starting to go on and on, but I do want you to understand how grateful I am to you for getting me to the light at the end of the tunnel. Again, thank you for all your help. I am very proud of my accomplishment, and you were a huge part of it. When my wife and I bought our log home in 2000, we were fortunate to be referred to Oasis Montana as "a good place for renewable energy products". We talked to Chris and received great assistance in sizing and choosing batteries, inverters, and solar panels plus propane stove and refrigerator. Her advice was invaluable and prices were the lowest we found. The best feature in dealing with Chris and Oasis Montana was the assistance we received with the inevitable questions that arose when dealing with new systems; she was always responsive, clear, and accurate. We are very happy four years later with everything we've purchased through Oasis Montana. We described approximately what we wanted--two Zomeworks Passive Trackers with as many solar panels as we could fit on them, and a grid intertie system. 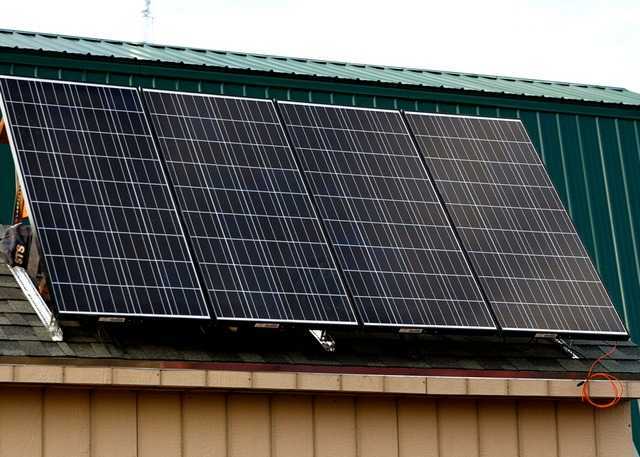 The helpful staff at Oasis Montana customized the package to maximize the solar capacity on the trackers, with an appropriate-sized inverter for the project, and included all the little parts and pieces we would never have even thought of. A year later it is still a thrill every day to look out at the system and know that we are generating our electricity from sunlight. The PV panels are working great and we are doing our small part to minimize the renewed chance of rolling blackouts in California by generating over 30KWh/day. Hope Oasis Montana continues to do well. I wanted to mention that we have really appreciated working with Dan on our project. He is knowledgeable, responsive and professional. I was not surprised to read on your web site that he really is a rocket scientist! Not to mention a personable and helpful person. In our opinion, he is a real asset to your company! You, of course, were also very helpful to answer all of my questions early on, before turning me over to Dan. Our panels are up and our Outback system is installed in the utility room. We are in the process of building our battery box, and next week our batteries will be delivered. It's amazing to think that we will have electric power in another week or so! Anyway, our next project will be to add a wind generator to our system, and we look forward to working with Dan on that one as well... Thanks again for being such a great solar resource! Thank you for your professional and as promised performance during the discussion, negotiation and delivery phase of our project. Your personal and company attitude is very much appreciated. Please feel free to use our organization and me personally as a reference should that be required. ...It's been about a year since we talked and I got my Oasis system up and running. I'm incredibly pleased with my system. It's functioned well and provides all the power I've needed to build the house. By the way, I installed the pump last week and it's working great. Hard to explain the joy that comes when people get water for the first time! Just wanted to let you know that our water pumping system works perfect!! The first day of use, it was very rainy but it still pumped about 700 gallons from 10:00 am until 6:00 PM! Thank you and Larry both! We had water flowing to the tank by 2 p.m. and really appreciate the quick service. Thanks! ...I was very happy to work with you and Oasis Montana. The great knowledge you guys have and all the help through my install was great to say the least. The pump is working great and I love watching the sprinkler go up and down as the sun comes in and out. I am still trying to get my grid electric pump house built so I have constant water at the house, but it sure is nice to not have to haul water. I am sure you will be my go-to company for my future wind and solar needs. Boy am I impressed! We have had the system up and running for quite some time now and works perfect. I just replaced my home well pump by a local well man and installed a Goulds 1 H.P. and I’m not sure that the Grundfos is too far behind it on output. Thanks so much for all your help; just sorry I didn’t get back to you sooner. Just wanted to say thanks for all of your help. From the day you shipped, the pump arrived within four days at my parents' place in Minnesota and then took only another three days to arrive with me here in Tanzania. I hooked up the pump about one week ago and it is working great. So nice to have water again. Thanks for the personally written note on my latest newsletter. Its amazing what an impact that has, made me write this immediately. The solar panels you sold to us all those years ago are still performing well. I have tried to fry them (accidentally). They have suffered a lightning strike with no damage and they got through the trials of the Tsunami which I had the misfortune to be right in the middle of. All in all not bad. Thanks again. We will have a beer with the Thai food we shall have this evening in honor of your great service and attention..
More than a year has passed, I realize, since we brought the Chinooks up to Dingboche in Nepal (over 5000 meters elevation), and I owe you an email! We conducted another expedition to a different part of the Himalayas this past May and while I didn't get back up to Dingboche our team leader, Dr. Alton Byers, did and reports that the Chinooks are doing great and that the villagers really love them! When I left the village last year I had wired up all the electronics and the overload dump with a kill switch in case the winds got too high when the area is unattended and we did a lot of testing on poles, but the cement and rebar and chains to hook up the guy wires and actually put up the poles hadn't arrived by the time I left (everything has to be hand carried in through narrow steep mountain passes). So after my workshops training people in their use and demonstrating their output and stall characteristics (by having four guys tilt a pole up into the wind and measuring with an ammeter) and finishing all the wiring, they had to let them sit. They sat for almost a year, awaiting the right crew of people and the right moment to get the concrete in the ground. When Alton got up there, though, they had been in place for some months and were the delight of the village. He told me he was greeted with great enthusiasm and the area is abuzz with excitement about putting in more. As our project moves forward we will look to you guys for more solutions and more windmills; thanks for everything you did to advise us and to get us the parts we needed; we are very pleased. I’d thought you like to know that the Air X and switches have arrived in Bodø and they seem to be in order. 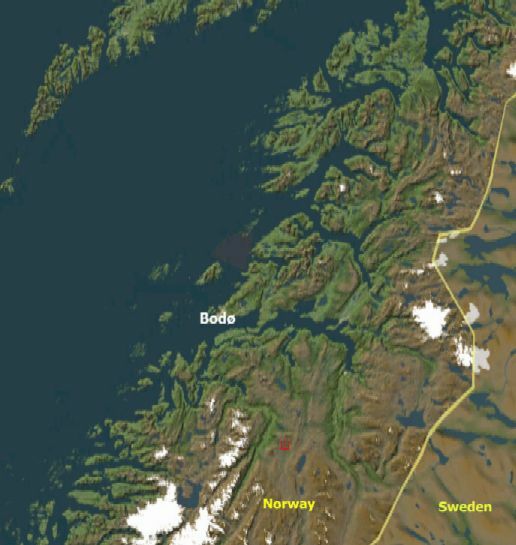 My parents are going to install one of the wind mills at their hut in the mountains about 30 miles (direct line) outside the city of Bodø in northern Norway. The hut has no connection to the electricity grid and it’s located in an area called Tollådalen (Global position: N 66º53.53, E 14º56.023). Since this can be a fairly windy area, I’m sure the wind mill will be very useful (the other mill is for some friends of theirs with a hut in the same area). My parents learned about the wind mill from other hut owners in the same area, so I thought you’d like to know where the hut is located. The attached image is a map of the location of the hut – marked with a red square containing a small cross. This section is a little above the middle of Norway (the Lofoten islands are just visible in the top left corner of the image). ...I just want to say, despite the hitches, glitches, and hiccups (shipping to India was a little bit of hassle), I doubt I could have randomly found anyone else on-line who could have been more helpful, (seriously). I truly appreciate everything you did. Wishing you and your team a great 2012! I've been using my new oven quite a bit too --I find the more I get used to it --The more I love it Its really great and the griddle I ordered as an extra is excellent it makes very good piklets. I cant thank you enough for all the help you have been ,Its been a pleasure doing business with you. Thank you . Both of my appliances have arrived and they are simply beautiful.... Thanks for everything. I know I shall enjoy them in Uganda as I cook up my recipes and then freeze them. Just today I met a woman who came to buy my old 36" gas range tell me how much she loved my new range from your company. I gave her one of the sheets that came with the range for contact information. She did buy my old stove--a Tappan with a griddle in the middle from 1948--but she may contact you about a new one in the near future...I can't tell you how much I love this new oven. I've gotten a lot of compliments on it from neighbors and family whom I've emailed pics to. Thank you for being so great with me on this sale--this was quite a 'splurge' for us as a family. And I'm thrilled that I went ahead and bought it. Chris, I really appreciate your help & your kindness... please pass on my thanks to the parts dept fella also. If you ever need a recommendation for you & your company, please don't hesitate to give them my email address. Thought I would drop you a line and tell you how pleased I am with your company; a few months ago I purchased a Peerless 36" stainless gas range from you, What a gem, it cooks great, it was everything you said it was and more. The gasman who installed it said it was built excellent, the burner systems were some of the best he had ever seen, he also asked where I had purchased it from, (of course I told him how to contact you); when I told him the price his jaw dropped down, I asked him if he thought that was a lot of money, his response was, Hell No, my company could not even come close to that price, the closest he could come to that would be a 30" S/S Stove with cheaper burners and that it would cost $1850.00, So, thanks again. Dave Gregory - Floral City, Fl. - Sweden Hi Chris, I just wanted to tell you that the refrigerator (Dometic RKE400) works fine. It gets very cool easily, so I have to keep the flame very low, which is a good sign. Thank for good customer care! Our Diamond 17 fridge has arrived in perfect condition. IT IS BEAUTIFUL. I AM IN LOVE WITH A REFRIGERATOR. THANK YOU SO MUCH FOR ALL YOUR HELP CHRIS. I was just sitting here in my dome, enjoying the quiet, and part of that is because of the LP fridge. No noise. Doesn't cycle. Doesn't go clunk at the end of that cycle. I appreciate that. Awesome news to report! The fridge door handle arrived on Tuesday. I can't possibly say THANK YOU enough for going light years beyond the call of duty in helping me with this. Mission accomplished ~ HURRAY!!! We had a great holiday in the boxcar with our family and were 100% satisfied with the stove and 'fridge. In fact, we like them a lot better than what is currently in our house at home! We will definitely be purchasing again when we build our house out there. That reply is as thorough as your order/delivery process.. Thanks so much Chris for your help.. When I need another refer, you can be sure I’ll call..
...You are great... I’ve been swamped here with work on the house but what’s keeping our energy up is eating off that fabulous range and drinking out of the refer... We love the new equipment you have sent us.. I have been on your mailing list since we bought our propane fridge from you. It as been a great investment for us and works fantastic! I don't know how we got along without it before. I am totally enamored of my Crystal Cold fridge; what a delight to have space and actually be able to keep things frozen! And have ice! I am writing to tell you how happy I am with my 15 cubic foot Crystal Cold LP gas refrigerator. My concern about how it would perform at an altitude of 9000+ feet was unnecessary. I installed it one month ago and after making some easy adjustments, it has worked great! Thank you so very much for all your help in deciding on and arranging the new fridge. It arrived and I believe will suit the situation well. These days it seem so rare to get to work with someone who is competent, knowledgeable, helpful and so very pleasant. A rare combination these days. Awesome! I happen to love getting your newsletters and like that you are now going paperless as well. We purchased a Summit refrigerator from you a few years ago and really really enjoy it! we call it our "Not-a-Food-Coffin" Frig because it forces us to eat what's in it and not let experiments go awry on a lower shelf somewhere...to die a slow death. Thanks! Thank you Chris and company! Our friends and family thought we were crazy to order appliances from Montana. The reason was clear for us -- wonderful service, excellent information and great prices. Really enjoying our new Premiere gas range with built-in griddle! The SunDanzer refrigerator and freezer are wonderful! We thought it might be a tad difficult to get used to a chest-style fridge, but it turns out to actually be easier to use than our old upright -- you can see everything. The efficiency of these appliances is nothing short of amazing! I don't know why everyone who is generating their own power doesn't have these appliances; Even during the past two weeks when it was mostly raining or overcast, our PV array generated plenty of power for the miserly SunDanzers! Thanks again for helping us to get off-grid. Hi Chris, thanks so much for your help, and good luck to YOU in your mission to ConServ energy!! Hi Chris, We love our fridge! Everyone who walks into our kitchen asks about it. I can’t tell yet how energy consumption compares to our old fridge, but it definitely keeps ice and ice-cream which the old one could not. In this hot weather, that’s really appreciated. Thanks for delivering just what we wanted. Dear Chris, I just want to say thank you and relay how impressed I am with your friendliness, courtesy, and professionalism; sadly, all are rare in today's economy. 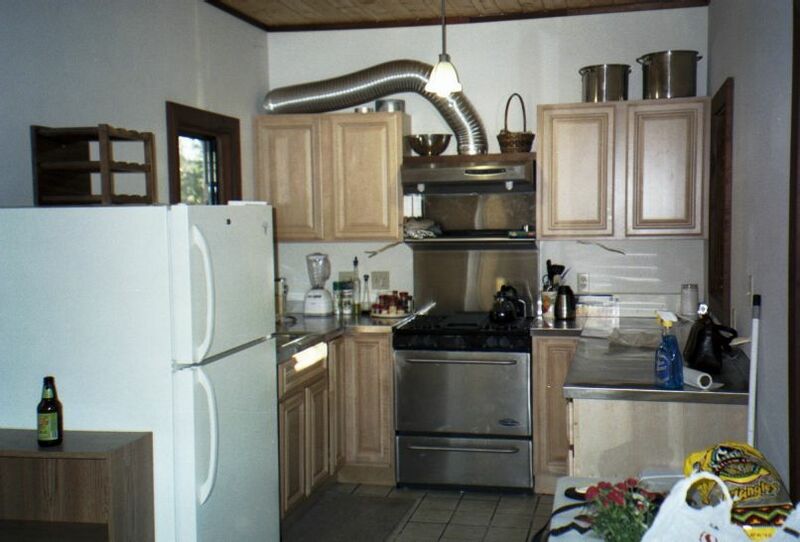 I like the looks of the refrigerator even without it in use. If all goes well with the schedule, I should be able to send you some pictures of it in place by Christmas. Steve I also want you to know how responsive and easy to work with Larry is! He keeps me coming back to you guys for help, advise, service, and equipment. Just wanted to again say how great everything has been through all the questions, numerous changes in system design, and my budget restrictions. I also want to thank you again for your time on a weekend to show me your system at work. I placed the order today, looking forward to getting it put together! Oasis Montana does great things around the world. Just browsing the newsletter is an education, I think. Hello and thank you. I am so, so impressed by Oasis. Please tell everyone there thank you. I can not thank you enough and want to say Oasis has been the best in solar, out of everyone I have looked into to. I was lost and now I know for sure what is needed and I have a real cost. You have made a believer of me in your company. I took the time to read all about Oasis Montana. I have been talking with you now by e-mail and phone. Let me tell ya, you folks really have a well put together News Letter and web site, packed with info, instructions, valuable tips, and conveys a sense of personal concern for the environment, doing projects correctly, explaining costs and a willingness to help. I hope you will pass along these comments to your owner there. I look forward to working with you. Tony Hall, GA.
You are the sweetest and most wonderful person I have had the privilege to deal with when ordering parts. Thank you so much for everything. Cunningham Communication Inc., Sinclair Broadcasting Group. ...wanted to let you know that I appreciate your prompt service... left me with a sad and melancholy feeling knowing that I may never again experience such warm and attentive customer service. We really appreciate the support you have given us. While all the vendors we checked out were similar in price, we got a good feeling from you and we are happy we did. Chris.. you are a wonder and clearly work beyond your closing hours! Very much appreciate your good service and excellent record keeping! You are the best at service, product and oh so friendly.. why go anywhere else! Guess what?? My system went to green blinking immediately! ...Thanks again for your quick & professional response, Chris, even with a concussion!! Amazing! You are, by far & away, the very best business person I have EVER had the pleasure of working with. Just want you to know that it's been a real pleasure working with you. You went above and beyond for us. Thanks, Chris, for your comments and that rare quality of honesty. My experience with Chris "a joy." My experience with Chris, of your company was a joy. Chris went above and beyond the normal perimeter of “customer service”. When Chris found out that the closest trucking dock for delivery was in Denver, Colorado, she worked tirelessly until she found someone to make a curbside delivery at a very good price. After making all that possible, she kept me informed about the day it shipped from the factory, to its progress to my curbside. She was always available to answer any questions I had. Great source for information on Renewable Energy! Jim I just want to say how much I appreciate this newsletter. I know a lot about alternative power, I built my own solar system in Costa Rica, but this taught me things (esp. The math to figure out battery needs) and has a ton of great resources. Wanted to take a minute this morning and tell you how much I enjoy your newsletter. I always look forward to getting it and reading it cover to cover. I have enclosed my check for $50. Please send me a kill a watt meter and keep the balance to help you cover postage. Please don't stop sending out your newsletter. Use the e-mail to send any updates. We ordered a propane refrigerator from you and have been receiving your newsletter regularly since that time. We're very happy with the refrigerator, and really enjoy the newsletter. Our hope is to be able to build a home some day and I would certainly make every effort to be environmentally friendly if we are able to. The newsletter keeps me in the loop and keeps me inspired - Thank you very much. I am sending a roll of stamps as a contribution. I had the pleasure of meeting you in John Day. Your website and personal information is outstanding. I will be in the market for a Peerless range, refer and some other stuff within the next year. Hope to talk to you again - thanks for coming to Oregon. Dear Oasis Montana, Thank you for your recent newsletter. Thank you for doing what you do. Your work is so important to all of us, even those that don't yet know about you!